But our commitment to being green goes deeper than the brand color. We are dedicated to creating green products that are safe for the consumer, safe for the tire, and safe for the environment—as solidified by Slime’s Green Promise. No. 1: Every year, 27 million scrap tires end up in landfills. Our tire repair products work to reduce that number. Choosing to use Slime sealant to repair a flat enables that tire to be cleaned, professionally repaired and remain in use (rather than tossed in a landfill). No. 2: We make products that extend the life of your tires and keeps them healthy. Regular use of Slime pressure gauges and inflators ensures that your tires operate at proper pressure levels, which maximizes tire tread life. No. 3: Our sealant formulas are environmentally friendly. Not only do they wash up easily with water, but they are non-toxic, non-hazardous, free of carcinogens, non-ozone depleting and minimally packaged. They even contain chunks of recycled rubber, further reducing tires in landfills. 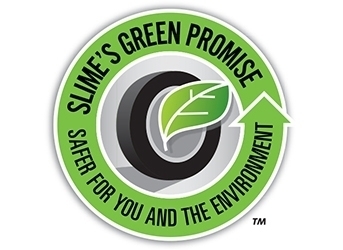 Slime’s Green Promise is our commitment to doing our part to keep our planet healthy. Together, we can reduce the number of scrap tires that end up in waste yards. Bleed Green!